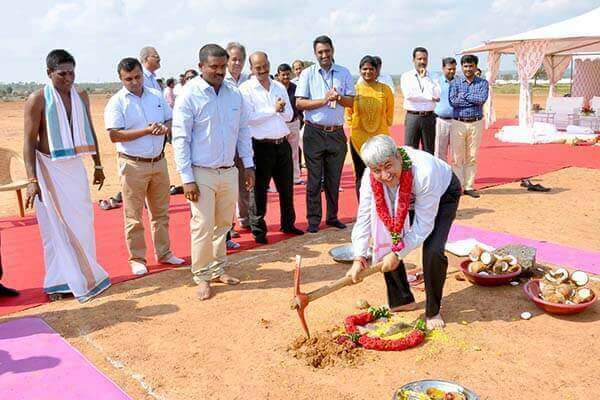 Sri City, March 16, 2017:- M/s Thermax Ltd., a leading energy and environment solutions provider, performed groundbreaking on Thursday marking the beginning of construction of its production unit in Sri City. Mr.
Ashish Vaishnav, Global Head, Cooling Business performed pooja and administered the ceremony. He expressed happiness as this was the second groundbreaking event during this week. The plant will be built on a plot of 40 acres in the Domestic Tariff zone in Sri City, at an investment of Rs. 150 crores. The plant will produce chillers for large scale air conditioning units, steam generators, and boilers etc. The company will provide employment opportunity for about 200 persons. The plant is expected to be commissioned by March 2018.
of heating, cooling, power, water and waste management, air pollution control and chemicals. Thermax has manufacturing facilities in India, China and Europe. The sustainable solutions that Thermax develops for client companies are environment-friendly and enable efficient deployment of energy and water resources.